If you're planning to get married, a prenuptial agreement is a good idea. 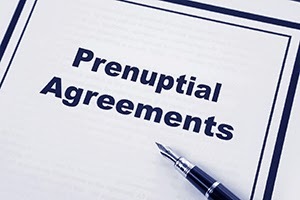 Most guys don't know that a prenuptial agreement specifies what happens to joint martial assets, not only in the case of divorce, but in the event of death as well. Now you can make a prenup on your own with minimum expenses. A prenuptial agreement specifies each party's rights, assets, debts and property before the marriage. Protecting your assets by preparing a prenuptial contract has never been this easy and cost effective. Attorney prepared legal forms including prenuptial agreement forms are nowadays readily available on the Internet for usually a fraction of the price charged by a lawyer. Ironically, it is probably the same form used by many lawyers across that nation. 2) You are preparing the form yourself thus again saving on work charged by a lawyer. It is recommend that you execute two original signed documents with one to be given to each party. Notary. Most states will require the contracts to be notarized. Witnesses. Some states requires that a prenups be witnessed as well as notarized. (2 witnesses are recommended). Financial Statement, Schedule A. Before executing your Prenuptial Agreement, both parties are urged to review not only their own financial statement for accuracy but also that of the other party. If the financial statements are materially inaccurate, it will affect the validity of the agreement. What are the common pitfalls? Never use a free form downloaded from the Internet. Such forms almost always contain errors and are incomplete. Have the prenuptial contract prepared and signed as soon as possible. Signing a prenuptial agreement close to the date of the wedding may indicate duress. A judge may void it based on this reason. Make sure to use a state specific and up to date form. In separate property states in which the law says you own most non-joint property and also debts in your name; a prenuptial agreement can create a much more even division of houses and also assets.